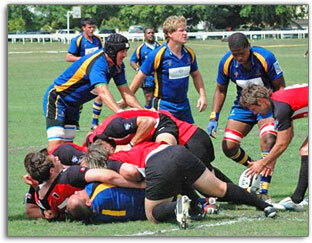 In Barbados, Rugby traces back to the 1900's when the British Forces, played the sport while stationed in Barbados. In 1964 the Barbados Rugby Football Union was formed as well as the erection of the Rugby Club House at the Garrison Savannah, which to this day is still the home to Rugby in Barbados, and is known for its festive after-match celebrations, no matter the out come of the game. The Barbados Rugby Union was the first and only team on the island for some years, later becoming a member of the International Rugby Board (IRB) in 1995. 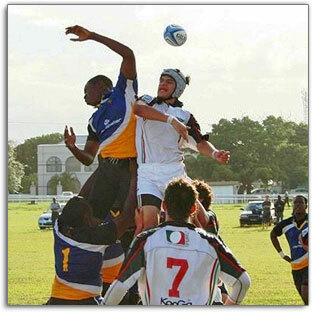 The sport of Rugby in Barbados is supported by a resilient group of committed enthusiast who despite many challenges has managed to maintain keen interest in the sport in this tropical climate. Even with the heat and dry grounds, rugby has been able to attract many visiting teams and players some internationally famous, from Clubs in the UK, Canada and neighboring Caribbean islands. Barbados rugby players may lack in mass but make up for it in speed, resilience and camaraderie. In recent years the local clubs have been busy promoting the sport in schools and at youth level, this attracts more youthful teams from abroad which has given us the opportunity to impact at the national level. To date results have been encouraging; with players competing at the World Sevens Competition and playing at Leicester Forest RFC in England, as well as the Barbados National team with its improved results, and performances at the Regional World Cup Qualifier, and at the Caribbean Championships at Senior men, women and U19 15 a-side and Sevens. These modest achievements are significant in a country where rugby is not the culture like cricket and other traditional sports. Touring teams and clubs are always welcome and are guaranteed the renowned Bajan hospitality, quality rugby and lively matches complimented with our popular Banks Beer and local Rum as a stimulant after matches. It is a perfect blend of competitive rugby and great partying. Presently the Barbados Rugby Football Union is the governing body for the sport on the island, and the Barbados National Rugby Union Team represents Barbados internationally. Why have Rugby Tours to Barbados? For specific information on Rugby activities and other events in Barbados, check out our Events Calendar or Daily Activities.